HomeFive Women Five Journeys: How Different Are We? 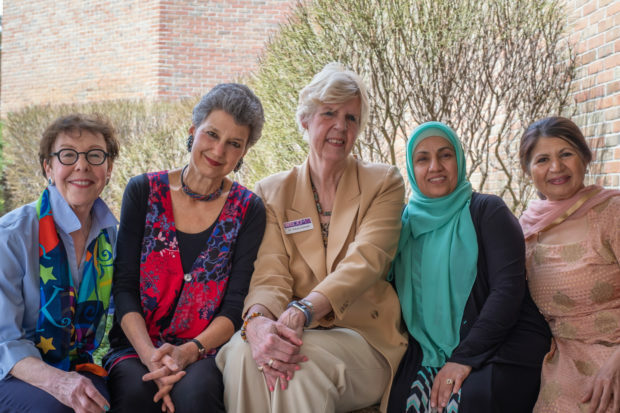 They started as three women of different faiths with a singular belief: that they could come together to share their stories and traditions, listen to one another and then build bridges among faith communities. 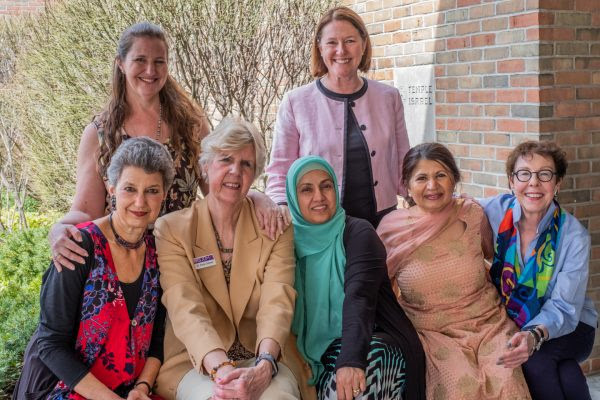 They were Gail Katz, a Jew; Shahina Begg, a Muslim; and Trish Harris, a Catholic; and together they brought other women into their circle and, out of those first connections, WISDOM was born. Gail Katz (Jewish): Co-Founder and President of WISDOM; retired ESL teacher and Diversity Club Sponsor in the Berkley School District, Education Chair of the InterFaith Leadership Council of Metropolitan Detroit, and Social Action Committee member of the Temple Israel Sisterhood Board. Paula Drewek (Bahá’í): Past President, WISDOM, retired Professor of Humanities and Comparative Religion, Macomb Community College; Fulbright scholar, now devoting much of her time to interfaith work. Parwin Anwar (Muslim): Multilingual educator in the Macomb Intermediate School District and lecturer with more than 22 years of experience specializing in international relations. A graduate of Kabul University, Parwin emigrated from Afghanistan to Pakistan having survived a harrowing escape from her war-torn homeland. Maryann Schlie (Unity): Wisdom Board Member, consultant to business and houses of worship in areas of leadership and systems thinking. Certified in programs including Lombard to train trainers. Moderator: Teri Weingarden (Jewish) WISDOM Board Treasurer, what follows are brief excerpts from a fascinating discussion. 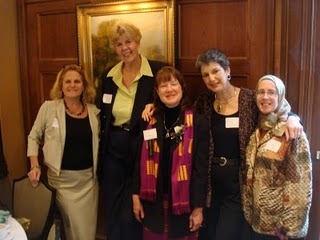 Women of WISDOM at Temple Israel: standing from left, moderator Teri Weingarden and immediate Past President, Peggy Dahlberg. Panel, seated from the left, Gail Katz, Paul Drewek, Parwin Anwar, Raj Chehl and Maryann Schlie. Teri: How did your childhood experiences impact where you are today in understanding and practicing your faith? Gail: I spent my elementary school years in Silver Spring, Maryland, in a secular Jewish household, in a relatively non-Jewish neighborhood. Until 6th grade, I was the only Jew in my class. Every morning, we’d bow our heads and say the Lord’s Prayer, Our Father who art in heaven hallowed be thy name – I could say it in my sleep. There was always the December dilemma, the Christmas pageants, the carols that I knew were not my songs. I was part of the assembly, but always asked to bring in a menorah to talk about that “Jewish Christmas” called Chanukah. In the 60s, my life changed when my father got a job at Ford Motor and bang, we moved to Oak Park. Now my classroom was about 85% Jewish. As the new kid, I was really nerdy, got all A’s. I was bullied by the girls for not being cool. This underscored the foundation for my teaching career working with immigrant children who were the other. My grandfather, an Orthodox Russian Jew—moved in with us when I was about 14. Suddenly from a secular household we became Kosher and observant. So I spent my teens hearing about the Eastern European Jews, the family he left behind, and those who were murdered in the Holocaust. I yearned to be as connected to my Judaism as my grandfather. And that started my journey . . .
Parwin: As a child, I was always in love with nature — I would spend hours outdoors, thinking about the beauty of nature. I remember standing out on the balcony of our home, watching the sunset behind the mountain. I was filled with so many thoughts, I got dizzy, wondering why are we here and then gone, what is our purpose. Those thoughts brought me closer to God, made me a writer, an observer of life . . . and an observant Muslim. That is who I am today – knowing that we are here to worship God and delight in the task . . . and beyond that, to do good deeds. Paula: I was raised in Kokomo, Indiana, and had an upbringing in both the Bahá’í faith and Christianity. I remember learning my religion mostly through prayers and songs. My mother would play on the piano and we three kids would sing. And then we had the prayers before bedtime, always with this recitation: Oh God, guide me – followed by several aphorisms like “As ye have faith, so shall your powers and blessings be.” So, I think these influences in my first five or seven years were very important because they implanted the seed of spiritual growth which I think is the heart of all religions. A strong influence in my religious education was the simple fact that we were a Bahá’í home in Kokomo – and a rarity at that time – and traveling teachers from around the world would come and stay at our house. That included visits from my great aunt Josephine, who was considered a Bahá’í pioneer to Cuba and Finland. Together, all their teachings brought the world closer and religion alive to me. Bahá’í is a group thing. One that prepared me for working in groups as an adult. And this WISDOM group is a very dear one to my heart. Raj: I want to share a story about what really stands out for me in my childhood as an influence in who I am today. . . I was born in India – in the northern state of Punjab, and I remember coming home from school one day, and I was crying. So, my grandmother asked, “Why are you crying?” I told her that the children were making fun of my name, saying that “Bryvinder” was actually a boy’s name. “Why did you name me that,” I asked, “I don’t like my name!” And then my grandmother sat down with me and she explained that our names are interchangeable, because we’re all the same. Boy or girl, we’re all the same. And that was such a powerful message for me, because it’s like wow, I’m equal to everyone. Those two lessons have always stayed with me: number one, we are all one. And two: to seek the light wherever I go and find the wisdom to see how we are all connected. Maryann: We are indeed one. My mom did the absolute unpardonable when she married my dad: not only did she marry a divorced man; she married someone who was not Catholic. So, Mom was excommunicated, we had to find another faith and the answer became Episcopalian. I grew up Episcopalian, but I pushed the limits, asking questions where I should have been silent. Like Raj, I too wanted to know why, or even why not? I was baptized too young to know the difference, learned by rote what was expected of me, and by the time I was confirmed, I could rattle off all the requirements. I could check all the boxes, but I was not grounded in what was underneath there. #1: God is all good, active in everything everywhere. #2: I am naturally good, because God’s divinity is in me – and in everyone. #3: I create my own experience by virtue of my thinking. #4: Affirmative I am, and affirmative prayer and meditation is connecting with God of my understanding. #5: Most important of all is living the truth that we know. What good is it to be grounded in your faith tradition, if you are not living it from the inside out? That’s Unity in a nutshell. “What common misunderstandings do you encounter?” In discussion: Raj Chehl explains a Sikh symbol. Teri: What do you think is the most misunderstood part of your religion and how have you personally dealt with that? Gail: People are still spreading the myth that there’s a Jewish conspiracy – a Jewish monolith – that we are in cahoots with one another and that we are trying to take over the world, the banks, the media – Hollywood. The fact that the Torah says Jews are the chosen people is frequently misunderstood and we all know the message doesn’t mean that Jews are better or smarter; it simply means Jews are expected to set an example — as “a light unto the nations,” of the world, about how to behave to our fellow man. We are commanded by God to take care of one another. In other words, Jews are judged by their actions, more than their beliefs. So, I like to think of Judaism not as a noun, but as an action verb. 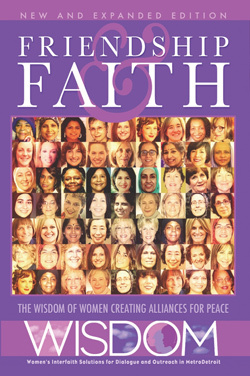 Paula: I don’t know that the Bahá’í faith is old enough to have a lot of misunderstandings. We’re 174 years old, so if any group is going to know about the faith, it’s Jewish people, because we share a holy land. Our world center is in Haifa, Israel. I think when people ask you about your religion, they really want to know how it relates to their own religion. I have a very simple explanation – the elevator speech: The Bahá’í faith is religion renewed. It’s not altogether different from any other faith. Because we accept the validity of all the world religions. They are all part of the process of God’s connection with humanity. For a Bahá’í, that connection never ends. And so the Baha’u’llah, the founder of Bahá’í, is but the latest stage in that growth and development. We celebrate our oneness – the oneness of God, the oneness of religion and the oneness of humanity. Parwin: Most of the misunderstanding of Islam comes from Islamic extremism – what many associate now with terrorism. Islam means peace. And I don’t believe there is any religion in the world that originated from violence. The words that we hear today – “Islamic terrorists” or extremist Islam . . . those are wrong. Islam is our religion – not a nation. I’m sure you’ve heard that women in Islam are not allowed to be educated. If that were true, I would not be here. Education is encouraged for both genders, especially for a woman because they are the first teachers of the children. Raj: “Sikh.” Most people are unfamiliar with the word. People ask what religion are you, and I say “I’m Sikh,” they respond, “You’re sick?” No, Sikh… S.I.K.H. So that’s the first misunderstanding, I almost always have to deal with that. Often people think that Sikhism is either a sect of Hinduism or Islam. It’s not. It is its own revealed religion. We have ten gurus – people that led us from the darkness to the light— and we have our own scriptures and holidays. Then there’s the turban myth; the turban is misunderstood to be Muslim. In the US, 99% of the men wearing turbans are Sikh, not Muslim. The turban is worn to cover the unshorn hair men maintain as an article of faith and is regarded as sacred and a revered part of Sikh identity – much like the kippah in Judaism. Maryann: Most misunderstood about Unity – it’s a cult. And since we don’t proselytize, we know that what you say about us is none of our business. My business, your business, God’s business. Teri: What stereotypes of your faith have you encountered? Paula: Stereotypes for Bahá’ís? There aren’t too many circulating. One I heard of is that Bahá’ís are synchronistic – that we must be a “put-together” religion. I think that comes out of the fact that we accept the foundations and basic teachings of all world religions. We have our own founder — Bahá’u’lláh — our own scriptures, our own dramatic history. Bahá’ís not a particular ethnic group. Bahá’ís are found in just about every country in the world. We don’t dress in any particular way. I would say the Bahá’ís in your midst are fairly invisible. Parwin: One thing we often hear: All Muslims are Arabs. No: Fewer than 20% of Muslims live in the Arab World. And nearly half of all Muslims live in South and Southeast Asia. The largest population of Islam is in Indonesia. Another stereotype: Muslim women have to wear black. No, we wear every color. In fact, so we love colors. On holidays, you’ll see how we dress up in every color imaginable. Gail: “Jews are rich or greedy” – that’s a common anti-Semitic stereotype that runs through history and it’s surprising how it still comes up. At an interfaith event downtown, I was seated with a woman who told me, “You know, my mother taught me never to talk to a Jew because all they were concerned about was money.” She was surprised when I told her I was Jewish and then told me that I was actually the first Jew she said she had ever met. We connected, we talked and by the end of the evening, I actually gave her a big hug and I told her, I was so glad to be the first Jew she ever met. I still believe we can make a difference, one person at a time. Raj: Stereotyping is the first line of defense for someone who is unaware and fearful. I haven’t personally experienced stereotyping, but I would say I’ve experienced micro aggressions. At work, for example, I had a boss who wanted to convert me to his religion. Unfortunately, after 9-11, many Sikhs, along with Muslims, have experienced profiling and stereotyping. In reality, the Sikh community is a small minority, here in the US, as well as in India where we are only about 2% of the population. Maryann: Personally, I have never experienced stereotyping around my faith tradition. The only stereotyping would have to do when I was 213 pounds. (But that’s a different story!) It makes me happy to know that we are a house of worship open to all and all are welcome. Questions? To learn more about WISDOM or to inquire about a Five Women Five Journeys Program for your organization, contact Paula Drewek at Drewekpau@aol.com.